An American swimmer specializing in short distance Breaststroke, she currently swims with Indiana State University but got her start from FJ Reitz High School and the Newburgh Sea Creatures swim team. Lilly has only been on the international seen for a couple years, but has already had some big accomplishments, as well as a big rivalry in Yulia Efimova. These two have had a couple heated exchanges, with King called Efimova out for her claim to be number one after a failed drug test, stating she was "not a fan". Lilly has conquered several individual breaststroke events, as well as showcasing her superior Breaststroke capabilities in numerous medley relay events, at competitions including the 2016 Rio Olympics, as well as both the 2016 Short Course World Championships in Windsor Canada, and the 2017 Long Course World Championships in Budapest Hungary. In addition to her medal count, Lilly has also also collected 2 world records, both achieved at the 2017 Long Course World Championships in Budapest. She has also holds the all-time meet records for Division 1 NCAA Championships in both the 100 and 200y Breast events. We see Lilly has chosen to reduce her DPS by an average of 0.02 m from Trials to Worlds. This puts her with the shortest DPS of the field, roughly got 7% less than the average. 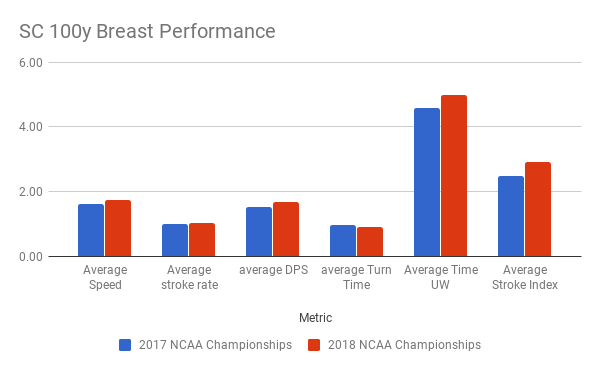 Conversely, in the SCY competitions, it appears Lilly is going for longer strokes, increasing by 0.15 m between the 2017 and 2018 NCAA Championships. Lily is ahead of the field by 3.48%, and is the fastest by 0.02 m/s. She has grown this lead lead from 3.26% at the Olympic trials in 2016 to the 2017 World Championships. Lilly's stroke index is not the most efficient in the field, which is expected given her shorter faster stroking strategy. She does come in just over 4% more efficient than the average on the field, but is back over .3 from the most consistent performer. Her consistent stroke race, coupled with increased DPS has allowed her to increase her efficiency by 0.44 in SCY. Just like her turn time, but more desirable, Lilly has increased her time underwater by 0.16 s on average from Trials to Worlds. She spends about 3% longer underwater than her competitors on average, but it serves her well - as she breaks out ahead as well. Lilly continues to increase her time underwater in her SCY metrics, by a larger margin even, at 0.4s. Performance at the Olympic Games, while impressive, is a statistical anomaly, which cannot be classified in calculating performance changes over time. We can see performance across the entire field get uncharacteristically faster than in any other competition setting. This is typical. During sprint events an athlete’s DPS isn’t everything. We’ve learned a short DPS can be more threatening than a long one, when paired with an amazingly fast Stroke Rate. King was playing with stroke rate and DPS to find her sweet spot! Again it is imperative to know your strengths and weaknesses, to know when surfacing will be most beneficial. Too early doesn't allow you to capitalize on the speed produced off the wall, while surfacing too late sees an athlete surpassing the point where underwater speed is faster than max above water speed. Strategies differ between short and long course competitions. Looking at the differences between her progression in the Long Course international, and Short Course NCAA fields, it is clear she has determined her best approach in both arenas, and has optimized her metrics accordingly. After a month of analyzing Lilly King, one of the biggest takeaways for swimmers looking to mimic her amazing performances is stay motivated, and continue testing and learning in training. 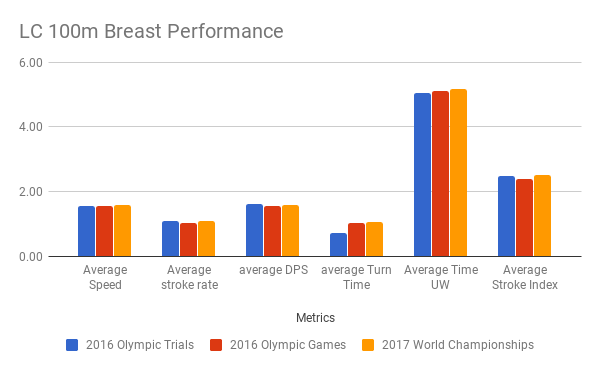 After comparing her performances at the 2016 Olympic Trials, Rio 2016, the 2017 World Championships, NCAA 2017 and NCAA 2018 it’s noticeable that her metrics remain fairly similar, but are progressively improving. She keeps adjusting her technique slightly to see what works to improve her overall outcomes, you should do the same.